You could just use the automatic installer present in the Cherokee Market. It would download and install everything, and make the necessary adjustments for you, both to Cherokee and your system. But for those wanting to do everything manually, here is what you should do. 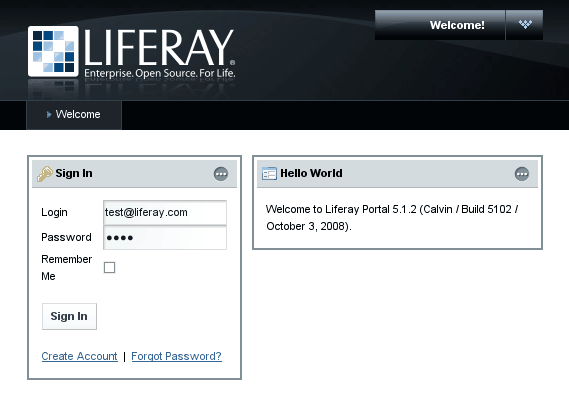 For this recipe we will be using Liferay Portal 5.1.2 Standard Edition. You can use the standard package which is shipped with Tomcat as application server, or simply download one of the others. There is a Glassfish version available. We will be using the former method, but you could choose the latter and just deploy the application in your favorite application server. If you chose the Glassfish release, you could refer to the Glassfish recipe and the rest of this document would be of no more concern to you. Before we proceed with the installation on Linux, you will need to make sure to have JDK 1.5 or later installed. We will be installing the package and then setting up Cherokee as a reverse proxy to access this Enterprise Portal. This part is trivial. As the Quick installation notes say, you just have to uncompress the package and launch the startup script. So, uncompress to /opt/liferay, launch /opt/liferay/bin/startup.sh and you are done with this part. It could give an error because it can’t find the Java environment. Simply set the environment variable and try again. This path is set to the symbolic link present in /usr/lib/jvm. Yours could vary, so take a look there. As stated before, you do need Java 1.5 or higher. Simply set up Cherokee as reverse proxy. You can either create a new virtual server with a matching rule (be it default or anything else) if you are sharing the proxy machine, or dedicate another machine to the Proxy Handler. This will be our choice, since typically you will be wanting to get the best possible performance, the Java application server is heavy by definition, and you could be using the proxy machine also to serve other contents. We are only going to set Cherokee’s HTTP reverse proxy handler to hit the server running Liferay at port 8080. Launch Cherokee-Admin on your proxy machine, create a rule that matches the desired path on your web server hierarchy -/liferay for instance- in your virtual server of choice, and define the HTTP reverse proxy handler from within the Handler tab. Once you launch Cherokee and access http://example.com/liferay, you should be presented with the login screen from before, since you will be receiving whatever is at http://192.168.1.100:8080/.